One of the best history books I've ever read. Certainly, the most entertaining. No doubt you've come across McCullough’s masterful Pulitzer Prize-winning book on store shelves or in the homes of friends over the years and there's good reason for its popularity. 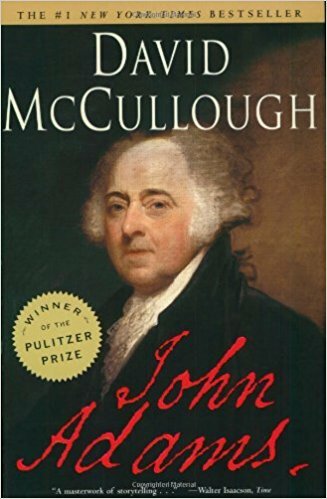 McCullough's John Adams is a first-rate narrative biography, and an absolutely incredible adventure story about one of America’s most fascinating founders. The book reads like a novel from start to finish as we follow Adams’ journey from his childhood in Braintree on the outskirts of Boston, to his early days as a lawyer in the nascent republic, his energetic and principled fight for American independence, through to his years as ambassador to France, Holland and Britain, and finally as Vice President, President, and elder statesman. Adams first emerges into public view during the trial of British soldiers that were responsible for the shooting deaths in Boston known as the Boston Massacre. It seems almost too convenient that Adams would have been involved in such a notorious and iconic event so early in his life’s story, and yet there he was. Adams certainly enjoys a lack of overt criticism throughout as McCullough seems to be especially fond of his subject. I found myself taken with Adams stances throughout the book, even during his most controversial moments as he passed and executed the Alien and Sedition acts of 1798. Some of this is no doubt due to the fact the John and Abigail Adams left us with a treasure trove of their correspondence so we’re able to witness first-hand their frustrations, passions and doubts as they kept in constant communication even though they spent so many years apart. Their beautiful, prolific correspondence serves to build a well of deep empathy in the reader and I found myself getting caught up in interpreting events from the Adams’ unique point of view. Yet it all really happened, and McCullough’s John Adams is first-rate narrative history that every American should read.